I've been working remotely now, from home, for over half a decade. I work in my home office, from cafes, from my tethered mobile, basically anywhere I can be productive and not feel like a phony. Here's the thing, though. I have to go to meetings, and I spend 15 minutes of those meetings waiting for YOU (yes, you, there) to unmute your mic, setup your cam, mess around with your internet, and generally waste the remote worker's (yes, me, here) time. So, as a customer service to the internet, I present. That domain points directly to this post. Please, tell your friends family and clients. Why not include http://howtounmute.com as a link in your meetings? See that circled icon? That's a muted microphone. Click to unmute. 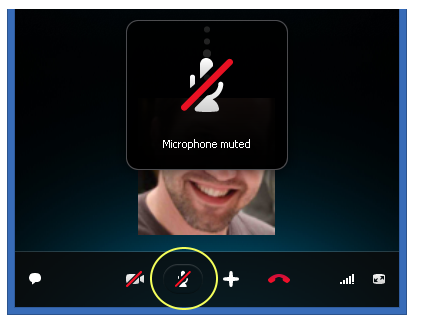 In Lync, this means your phone and mic are turned off. Click the left one to unmute! Click the right one to turn on your cam! You can also use the "Win+F4" global hotkey to unmute Lync. The unmute button is at the top of the hangout. 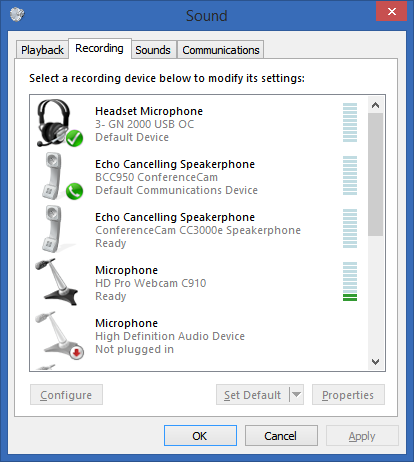 Click the little Settings Gear to select your microphone and speakers from within Google Hangouts. Using Some Weird old Adobe Flash-based Web Conferencing Thing? You can select your Microphone and see the bar move on the right, indicating it can hear you. Wait, did you select the right microphone globally? Most apps let you select microphones within the app. You can also set your preferred mic globally. Which mic am I using? 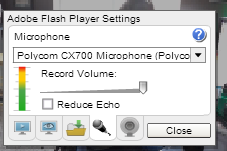 Right click on the little speaker near the clock and select "Recording Devices." Some machines have more than one microphone. 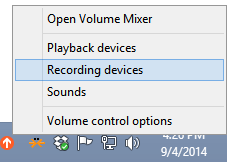 Windows lets you set a "Default Communications Device" for calls like Skype, and this is different from the "Default Device" for regular audio apps like Audacity. Right click to set your default. PRO TIP: Tap your microphone (or where you think it is) to confirm where you THINK it is. Watch the green bars move. Applications can also select their individual preferred microphone. Here's Tools | Options in Skype. 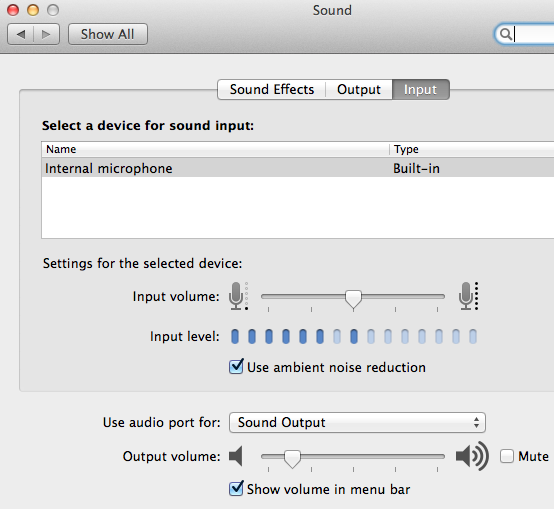 See how I can select where I want my audio output to go? And where I want my input to come from? That's cool. Type "Sound" into Spotlight and open your settings. Note you can see your input volume, your preferred input devices and preferred output device. There is VERY likely a microphone mute button on the phone. Familiarize yourself with the phone's buttons and try this one. Maybe you have a headset? Does it have a mute button? Maybe you bumped it. If you take 5 to 10 minutes NOW to make sure you know how to select your microphone and umute yourself, you will save remote workers everywhere 15 minutes for every 1 hour meeting. Sponsor: Many thanks to Intersoft for sponsoring the feed this week! Enterprise cross-platform native apps development made painless with Intersoft Crosslight. Sounds too good to be true? See it for yourself and get started today! Man, this made me laugh. I can't put this into meeting invites though, many in my office already think I'm the annoying IT guy that's always telling people how to do things. I patiently wait (lurk?) for someone to ask. Maybe we can also educate people on WHEN to mute your microphone, especially when people are in a public or noisy place ! Ah, no - don't ever tap a microphone unless you want to damage it and everything it is connected to. Click your tongue or snap your fingers, but don't ever tap. In elementary school, I loved being and AV (audio-visual) library assistant and running the mimeograph machine. I knew all the tricks to getting that film strip projector to work. I was an expert overhead projector operator. And I could thread a 16mm projector faster than anyone. Now we have buttons. Buttons for everything. We have buttons coming out of button holes. And despite the standard icons for buttons, we have yet to master the damned mute button. Will humanity survive? I don't know. 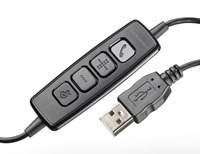 Scott, another thing I spotted when working with Lync is that if you plug microphone or headphones during connection (and it happens esp. at the beginning), the connection is put on hold, which is not immediately obvious. You may want to include that info, too. I can't echo Robert Slaney's comment above enough. There's far too many times people unmute themselves and then proceed to do things that they don't think about, but the microphone picks up. You know how your headset has a microphone right there next to your face? Yeah, it picked up that you scratched your beard and now so did everybody in the meeting. You know that fan you have blowing on you cause it's hot at your desk? To everybody in the meeting it sounds like you're driving down the freeway in a convertible going at least 60 MPH. So it's just as important to learn how to unmute yourself, but it's far more important how to learn to stay muted until you intend to talk as well as set up your environment so your microphone is only picking up you. This goes both ways. I'm frequently in situations where I'm meeting with someone who decided to work from home or remotely only to wait for them to figure out their mic issues. We're now in a world where it often doesn't matter where you actually work from. Everyone needs to be cognizant of that and make sure they're setup to have virtual meetings whether in the office, home, or Jamba Juice. Point taken Scott. I laughed pretty hard on this one, but I think you should have waited till you were on vacation to write this. ;-) You sound too pissed off and condescending. Are you seriously going to share your howtounmute site with anyone you work with remotely!? Good luck. I can sense an enormous amount of rage behind this post. Not generated all at once, but perhaps in small amounts over many many years. But still, in all, an enormous amount of rage. Even if you are prepared there can be several things beyond your control that can go wrong. I find software updates most annoying. When Skype has an update, it shows a progress bar with the message "Just a moment, we're improving your Skype experience". I wish they didn't say "Just a moment"
as always you are pointing out the fundamental things. Everyone wants to have online meetings, but noone seems to care to be "ready" when the meeting starts. If the people would do physical meetings they wouldn't start to get a coffee, a pad and a pencil as soon as the meeting starts. That would be considered disrespectful. I can't count the online meetings people are late to arrive to, start messing around with their microphone, yelling some last minute things to other people etc. As Robert Slaney already pointed out it is also extremely important for people to keep the mics muted in loud and busy environments. I'm going to third (fourth? fifth?) the sentiment that people not MUTING themselves is infinitely worse than unmuting. I'm not sure I've ever encountered someone who had an issue figuring out how to unmute - rather, that they didn't realise they were muted. But people are CONSTANTLY unmuted, and it eats well into 15-20 minutes of an hour-long meeting waiting for an unknown person's dog to stop barking, for the garbagemen to go by, for the truck to pass their car, for them to get out of the tunnel, etc. So true, annother thing i tend to do if i setup a lync/cucm/asterisk meeting environment is have a hardcoded echo contact in the global contacts list (just like skype) that way support becomes: call the echo number, do you see your self? can you hear your self? WebEx is missing, that's where in my company a lot of people struggle and specially with the "call me" feature. I believe this falls into the category of be prepared for your meeting. I have wanted so badly to walk out of demos and sprint retrospective before plainly due to the fact that the presenter was still getting everything ready for the first 15 minutes of a meeting. Getting the service desk to trouble sheet the web conference or opening all his windows on the laptop or even waiting on the laptop to install updates. If you have a meeting, be prepared. If it is web be online and ready to rock. If it is in person have your stuff together and hit the ground running. If you are presenting get there early and get everything turned on. Check your equipment early in the day to make sure its ready and working. The golden rule of meetings. Don't waste other peoples time. Time is valuable to us all and you cant give it back. If I have to watch you fumble through your unpreparedness then you are stealing my time with your incompetence. People also struggles with windows live meeting that also you can add here.. I almost did a spit-take reading this. We spend endless hours teaching people in my community how to MUTE their microphones. We drag papers over the top of them. We have the worlds loudest sneezers amongst us. We have people that whistle. We have people that take a phone call, turn off the speakers so they can talk, but forget to turn off the microphone. I would like to also point out, if you are using Skype, un-check those annoying boxes which say "Automatically adjust microphone/speaker settings". Have had a number issues all involving these two little gems. 2) Add a section showing how to test it.